The versatile 7-footer is a coveted center in a league straying away from traditional big man roles, thanks to his solid game away from the rim. However, the last two years have been difficult on Lopez after he signed a 4-year, $61 million contract extension in 2012 with the Brooklyn Nets. A foot injury kept him out of all but 17 games last season, and he’s been trying to shake off a reputation as an oft-injured player, despite his high ceiling. It’s been a decent month for the California native, who has shown flashes of the explosiveness and versatility that have given him so much value as a two-way player. He’s finishing well at the rim, converting 14 of his 24 shots from within five feet in his last five games for a .583 clip (with the league average being .552). He’s also shooting 50 percent from 13 to 18 feet, going 6-of-12 in that same span despite only playing 26.2 minutes per game. Lopez may not be the most attractive guy you can find, but the Nets are craving good looks, especially with Deron Williams sidelined for a while with a fractured rib, and his ability to pick-and-pop provides better spacing for his team. He’s a great screener, and he can attack the rim off the dribble with his solid mobility and athleticism (just ask the Sixers). The Nets have looked a lot less suffocated with him on the floor thanks to this versatility. Their offensive rating with Lopez off the floor this season is an awful 98.4, a bottom-three ranking in the league. With him on the court, it jumps to 100.7, good enough to climb out of the bottom 10. 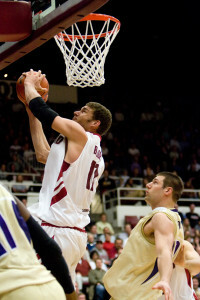 He’s still defending the pick and roll well, something he did incredibly during his time at Stanford. His quick feet and high IQ allow him to drop off to the paint against speedier guards, and opponents’ field goal percentage at the rim is 48.9 percent when he’s around (the league average is 55.2 percent). It hasn’t been all sunshine in Brooklyn, though. Lopez has only played over 30 minutes twice in the last 30 days. The emergence of Mason Plumlee in his sophomore season has eaten into Lopez’s playing time (Plumlee is averaging 22.8 minutes per game, up from 18.2 in his rookie campaign). Lionel Hollins hasn’t yet figured out how to play the two together without imploding his offense, which has hurt Lopez’s continuity on the court. The Nets recently picked up Plumlee’s third-year option, and Lopez has been on the trading block for the last couple of weeks, with the Rockets, Thunder and Heat all potential destinations. This suggests that the Nets may be heading in a new direction that doesn’t include Lopez. The race for the bottom three seeds in the East is wide open, though, and they’re currently sitting half a game above the Charlotte Hornets for the eighth playoff spot. The Nets have to decide what they want to do with their season, but Lopez needs to string together a long stretch of consistent excellence to finish off the year. He’s a special talent and has the opportunity to establish himself as an All-Star for a long time if he can stay upright. In that sense, this will be a defining season for him. The skill is there; it all comes down to durability. Robin Lopez (Brook’s twin brother) is still out from a broken right hand he suffered on Dec. 5 against the Spurs. He was expected to miss six to eight weeks; six weeks would put him on the court on Jan. 28 against Cleveland, but it will likely take longer, much to the Trailblazers’ anguish. He switched his cast for a soft brace this week, though he’s still not holding weight with his right hand, and he says it feels weaker than he expected. Contact Irving Rodriguez at irodroguez ‘at’ stanford.edu. Irving Rodriguez is a beat reporter for men's soccer and basketball. He was born in Mexico, but has lived in Chicago since second grade. He is all too willing to skip homework in order to watch the Chicago Bulls and Manchester United and will defend Derrick Rose until the very end. He likes to write about soccer, basketball and analytics. Irving is a senior majoring in Physics. To contact him, please email irodriguez 'at' stanford.edu.